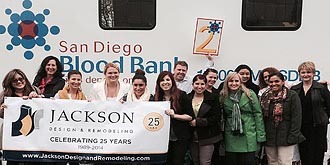 In 2014, Jackson Design & Remodeling celebrated 25 years in business by giving back to our community in 25 ways. Our entire staff participated in this effort, a confirmation of JDR’s commitment to meaningful contributions in our community. Our number signs were handmade with care for each event. 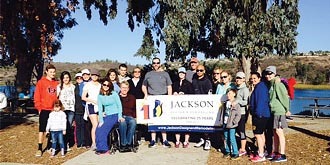 For our first community action, we joined JDR client Nancy Hauschildt in a fundraising 5-mile walk/run around Lake Miramar she organized to benefit Orphan Relief for Typhoon Halyan victims. 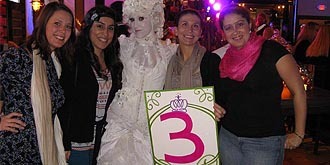 The Princess Project San Diego dresses and accessorizes financially challenged high school girls for their proms. Our team was thrilled to donate prom dresses, attend their fashionable, festive event, and donate a much-needed ladder to the organization. 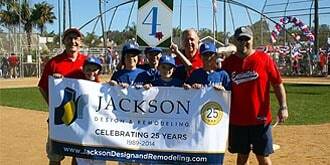 On opening day, we celebrated one of America’s favorite sports with a donation to the Encinitas Little League. The organization is close to the heart of JDR Architectural Designer John Kavan, who has been active in the league for many years, including 9 years as a coach. 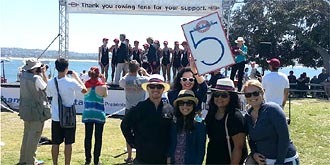 Our team was excited to support the San Diego Crew Classic, which promotes the highest ideals of amateur athletics and is the premier spring rowing regatta in the United States. JDR became involved with the event several years ago at the invitation of Kay Porter, a JDR client and long time Crew Classic advocate. 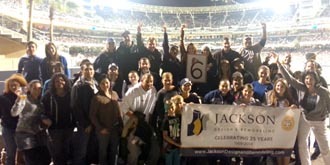 At the San Diego Padres’ annual tribute to the fire service, the JDR team showed up in full force to cheer on the home team and The Burn Institute, the beneficiaries of the evening. It was a lovely San Diego evening made even more beautiful with a Padres win! 7. 5K Walk/Run and Easter Egg Hunt for ACT Today! The JDR team put on our running shoes and eagle eyes to participate in the 5K Walk/Run and Easter Egg Hunt to benefit ACT Today! (Autism Care and Treatment Today!) an organization that supports military families impacted by autism. It was a wonderful way to celebrate the spirit of Easter. 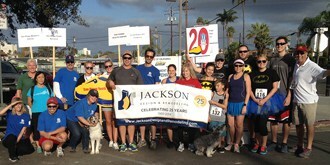 The JDR team and our canine friends celebrated four-legged Superheroes at the San Diego Humane Society and SPCA’s Walk for Animals in Point Loma. Our team was happy to support the San Diego Humane Society and SPCA’s efforts to promote the humane treatment of animals, prevent cruelty to animals, and provide education to enhance the human-animal bond. 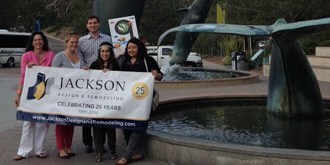 JDR supported the Birch Aquarium at Scripps by sponsoring their Green Flash Concert Series and providing a donation. Birch Aquarium at Scripps is the public exploration center for the world-renowned Scripps Institution of Oceanography at UC San Diego. 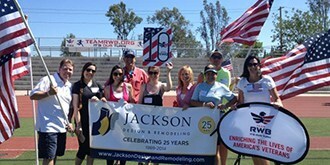 Jackson Design and Remodeling joined Team RWB for a heartfelt day of patriotism and inspiration as we walked in honor of Adrian M. Perkins, the nephew of JDR’s own Chris Ashby. Team RWB’s mission is to enrich the lives of America’s veterans by connecting them to their community through physical and social activity. 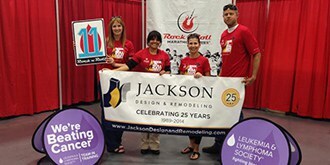 JDR’s Karina, Simone and Stina went the distance for charity by running in the 17th annual Rock n’ Roll Marathon to benefit the Leukemia & Lymphoma Society. 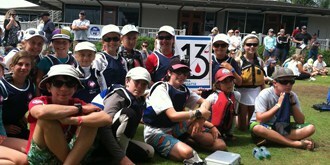 LLS is the world’s largest voluntary health agency dedicated to blood cancer. The local beach was cleaner and spirits were high when a group from JDR joined Surfrider Foundation for a Beach Cleanup day. Surfrider Foundation is a grassroots nonprofit environmental organization dedicated to the protection and enjoyment of our oceans, waves and beaches through a powerful activist network. 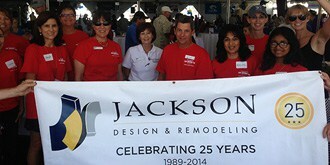 Jackson Design and Remodeling was proud to support the San Diego Yacht Club’s Dutch Shoe Marathon and Leukemia Cup Fundraiser in July. 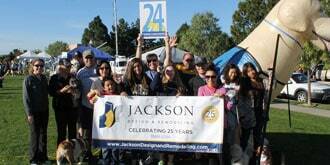 Now in its 45th year, the race was even more special in 2014 as it supported twelve-year-old sailor Jack Egan, one of SDYC’s most promising young competitors and a current Sabot II champion, who was diagnosed with lymphoblastic lymphoma. It was wonderful to see so many young aspiring champions racing for a good cause! 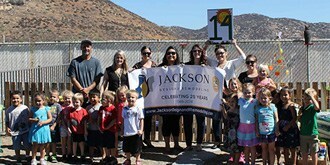 Jackson Design and Remodeling and several industry partners teamed up to create a sustainable garden for Giggles and Smiles Child Care Center in Santee where the children can enjoy nature while learning about growing food, composting and healthy eating. Months in the making, this group effort involved a significant labor of love and thousands of dollars in material donations. Read the details of this ambitious community project here! Our team put their super powers to work to create a design for the Tables for Tots fundraiser established by Ronald McDonald House Charities of San Diego in 2009. Local architectural and design firms, as well as industry professionals, registered to receive a child-sized set of table and two chairs. They used their creative talents to build the most inspiring solutions, which were then exhibited and auctioned. 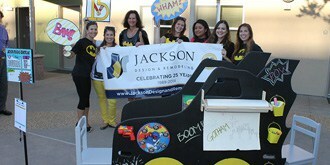 JDR’s Batman Interactive Station design sold for over $300. Kapow! 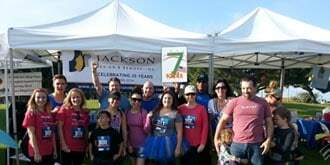 An energetic JDR team practiced their potato sacking skills for the Jacobs & Cushman San Diego Food Bankduring a wonderful community event to benefit the largest hunger-relief organization in San Diego. Last year, the Food Bank distributed over 22 million pounds of food, and the Food Bank served an average of 320,000 people per month in San Diego County. 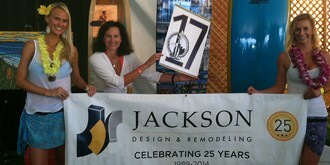 The JDR team was honored to participate in the Luau and Legends of Surfing fundraiser. We became involved with this event five years ago through our wonderful client Donald Takayama, a professional surfer and surfboard shaper, whose longboard is displayed in the JDR showroom and signed to “Team Jackson.” Now in its 21st year, Luau & Legends has donated over $6 million to the UC San Diego Moores Cancer Center. Happy to go fishing for a big cause, JDR supported the 25th annual Tuna Challenge for the San Diego Make a Wish Foundation. Since 1980, Make-A-Wish® has given hope, strength and joy to children with life-threatening medical conditions. Make-A-Wish® San Diego grants wishes to eligible children in San Diego and Imperial Counties. The JDR team went down the rabbit hole for the Girl Scouts San Diego’s 17th annual fundraiser with an Alice in Wonderland theme. The annual Urban Campout event helps keep Girl Scouting available and affordable for 30,000 local girls. 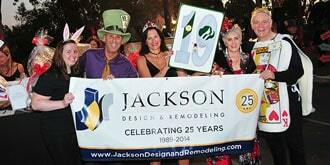 JDR has participated in the fundraiser for several years by attending the event (always in creative costumes!) and contributing to the Silent Auction. 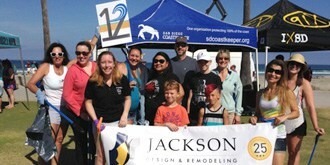 JDR teamed up with San Diego Youth Services, an organization that helps improve the lives of hundreds of thousands of homeless, runaway, abused and at-risk youth, for the 25th Annual AIDS Walk & Run and helped SDYC reach their fundraising goal. We joined over 8,000 individuals and organizations to remember those who have been lost and to raise funds to support the more than 20,000 San Diegans living with HIV/AIDS. 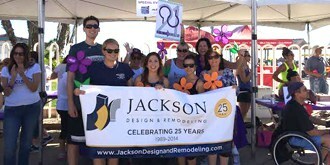 JDR staff teamed up at Oceanside Pier with high spirits and comfortable walking shoes to join the Alzheimer’s Association Walk to End Alzheimer’s®, the world’s largest event to raise awareness and funds for care, support and research for Alzheimer’s disease. Alzheimer’s disease is the nation’s sixth-leading cause of death and the third leading cause of death in San Diego County. The Walk to End Alzheimer’s inspires participants of all ages and abilities to reclaim the future for millions. 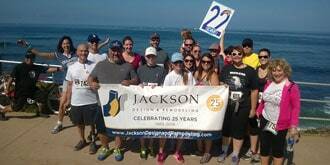 The JDR team enthusiastically participated in the Challenged Athletes Foundation® (CAF) San Diego Triathlon Challenge by walking a 5k at La Jolla Cove. CAF provides support to people with physical disabilities so they can pursue active lifestyles through physical fitness and competitive athletics. Over the past 20 years, the San Diego Triathlon Challengehas become one of the most highly-regarded in the triathlon world, helping more than 8,200 challenged athletes make it to the starting line. San Diego Habitat for Humanity builds homes for families in need. 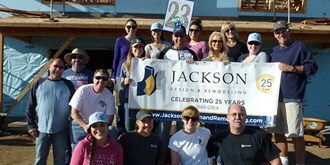 The Jackson Design and Remodeling team has strongly supported SDHFH for more than 10 years with donations from our seminars and material contributions to the SDHFH RESTORE. 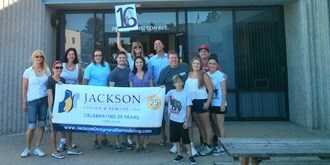 We got out our hammers and ladders and took our partnership to a new level by constructing a new home with a JDR Build. 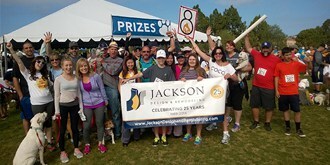 The JDR team showed up for man’s best friend in the Canine Companions for Independence Dog Fest Walk ‘n Roll. Canine Companions for Independence enhances the lives of people with disabilities by providing highly trained assistance dogs and ongoing support. The result is a life full of increased independence and loving companionship. 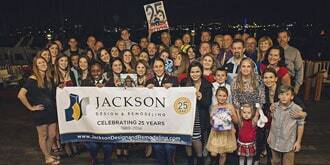 Jackson Design and Remodeling wrapped up 25 acts of giving back in honor of our 25th anniversary with our 10th annual Toy Drive in partnership with the Marines Toys for Tots Foundation. This treasured tradition helps deliver a message of hope to less fortunate families in our community. Our Toys for Tots boxes were once again filled to overflowing with generous gifts from team members, clients and friends.